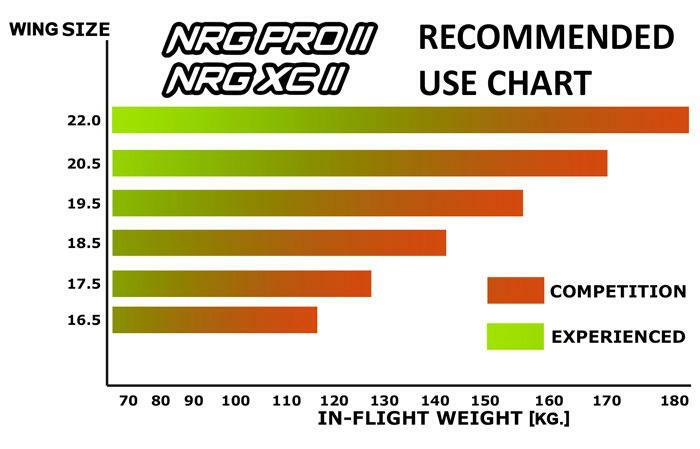 NRG PRO/XC II - Apco Aviation Ltd.
New sizes – 19.5, 20.5 and 22 square meters are now available! Offered alongside the original sizes of 16.5, 17.5 and 18.5 square meters. NRG XC II and NRG PRO II have been out on the market for a few months only and gaining popularity every day! Following requests from numerous pilots, we are now launching additional larger sizes for both versions of the NRG. NRG XC II – Closing the gap between the NRG XC 18.5 and Force II small, the larger sizes deliver a fast and agile cross country experience for any experienced pilot. Fitted with the ABS system, at accelerated flight, it is a stable and efficient cross country machine. NRG PRO II – for thrill seekers that can handle the fastest and most agile wing out here. The additional sizes allow the same feel and excitement but easier to control take-off and landing due to the lower canopy loading. An additional color option has now been added! NRG color design is the most eye-catching for those who wish to stand out!